In this two-day, in-person, initial training course, you will learn to use Therapeutic Listening® modulated audio selections to create individualized, home-based programs for clients. You will also learn how to implement Therapeutic Listening strategies in conjunction with postural, respiratory and sensory activities. The course will take participants from assessment through treatment outcomes; creating complete Therapeutic Listening programs. Case-study video presentations will be used to illustrate points and show changes in individuals with listening and other sensory processing difficulties. This course will be, especially, meaningful for practitioners who have a background in sensory integration, including therapists in schools, hospitals and private clinics. 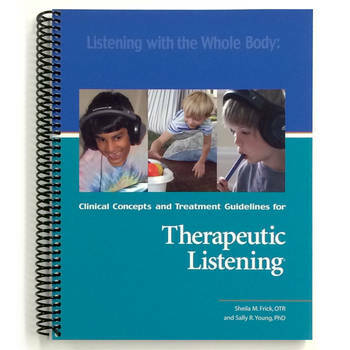 Registration includes the handbook, Listening with the Whole Body: Clinical Concepts and Treatment Guidelines for Therapeutic Listening. Take an additional discount of $25 per participant for groups of 3 or more individuals enrolling simultaneously. Check-in begins at 8:15am PDT on day one & day two. Vital Links is an AOTA approved provider of continuing education. Participants will receive 13.0 contact hours or 1.3 AOTA CEUs for this course. If you choose to register via Purchase Order, please attach a scanned copy of your completed and signed form to your “shopping cart” during checkout. Otherwise, you may fax the form to: 1-866-636-9720. Note: please add an administrative fee of $15.00 to each order submitted via Purchase Order.